New Year, and finally, new baking. Having had my fill of lovely Christmas things I didn’t fancy anything with dried fruit in today, which is most unlike me because I love my dried fruit. 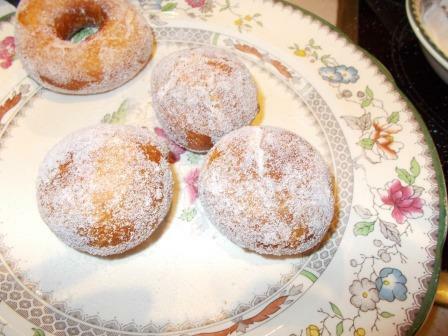 So, taking some inspiration from the celebrity Sport Relief Bake-off programme which featured doughnuts as a recipe, I’m trying them for the first time. The easiest-looking recipe I had to hand was from the River Cottage handbook 3, and which also handily appears on the Telegraph website (sssshhh, don’t tell the Guardian I’ve gone off-piste, but it isn’t the same without Dan Lepard). 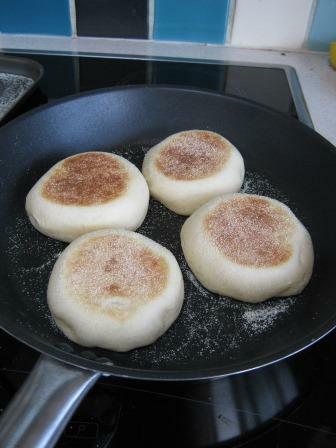 You can try Paul Hollywood’s recipe over here too. As I often do with recipes when trying them for the first time, I’ve only done a half measure of all the ingredients, and I’ve used fresh yeast, not dried. I don’t have a mixer so I’ve adapted the River Cottage recipe to the Dan Lepard method. 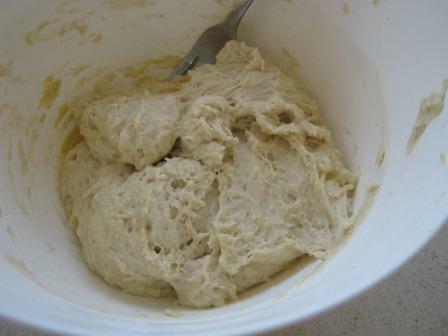 I mixed all the ingredients, left it for 10 minutes, kneaded lightly and then repeated two more times. In between I left the bowl cuddled up to the big pan I have boiling oranges for marmalade (I use Delia’s recipe for that, and there’s a blog over here about it from last year, nothing new to say on that subject this year) as the kitchen is heading for Baltic conditions again – currently 18.7 C.
Then I left the bowl to allow the dough to prove for about 45 minutes before making it into balls and rings. My son doesn’t much like jam doughnuts, but he does like the ring ones. I just poked my finger through like I would for bagels. I’m also making pizza so need to fit it all in together. They got to rest for about an hour before being fried. Some time later…. Results are in. Not bad for a first attempt, but a bit stodgy. 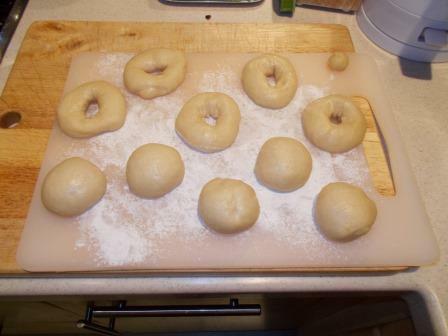 Next time I might let it prove a bit more the first time, fry them with a bit more oil, or make them smaller or make them all ring doughnuts. 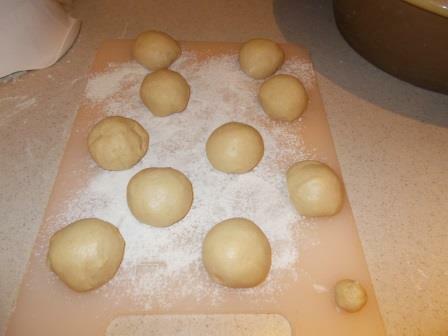 The ball ones expanded a bit, then split, but the outer surface was cooked before the inside had finished expanding. Here are some pictures of what went on! I’ll definitely be needing a good long run tomorrow. Still working my way through his TV series recipes. This one is over here. 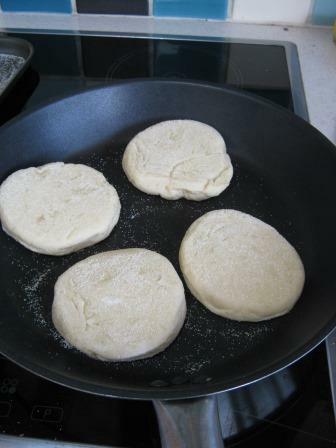 Pittas are often the first bread that people try to make at home because they are essentially easy and don’t require much effort. 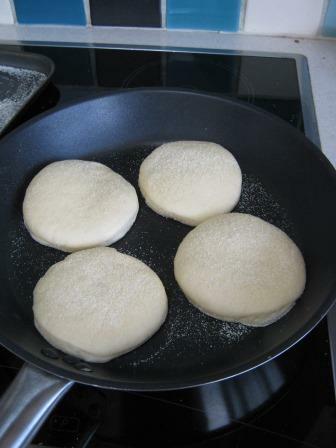 I remember making them back in the dark ages, as a student in the late 1980s I can even remember making the pancakes that go with Peking Duck, although I’m not sure I ever did the duck to go with them. 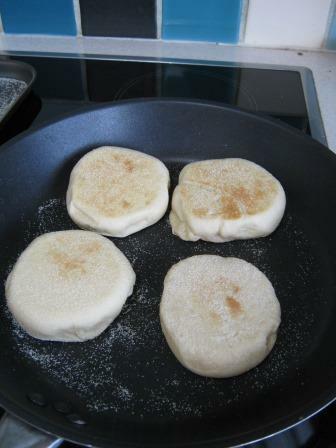 Back then I used the pitta recipe in Arto der Haroutunian’s Yoghurt book. Back in those days yogurt had an ‘h’ in the middle of it and the book had no pictures. If you can get one second hand on under the Penguin imprint I commend it to you. I never thought much about the author back then, but the book reads like he knows what he’s talking about from personal first hand experience. It also contains a fantastic banana gateau recipe which I may try again sometime soon. Checking out his website today you’ll see he’s been dead a while but as he was born in Syria of Armenian parents under difficult circumstances, he’d probably not be happy about what’s going on in Syria today. Nothing particularly tricky in there, nigella seeds can be got from the supermarket, but note that there’s quite a lot, so if you take to them you’ll be spending about 75p per batch just on seeds if you get the Bart ones from a supermarket (like I did – idiot!) I’ll be getting some Kalonji seeds from an Indian grocer or the ethnic bit of the supermarket they have them, not spending another £1.69 or whatever it was in Waitrose for 45g of Bart’s seeds. I’m not entirely sure why they are in the pittas when they normally turn up in naan breads. 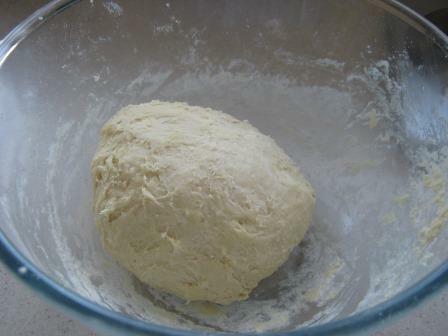 There’s quite a lot of yeast for a small amount of flour and also the salt is high at 1 tsp for 250g of flour. Other recipes may vary, like Dan ‘ over here, so let’s see how it turns out. I’m still fascinated by the idea that ‘professional’ bakers can give such different recipes for essentially the same thing. OK – pictures below. Nothing particular to complain about there. We ate some with some curried chicken leftovers, mango chutney and yoghurt, in deference to the almost naan bread flavouring the nigella seeds give them. 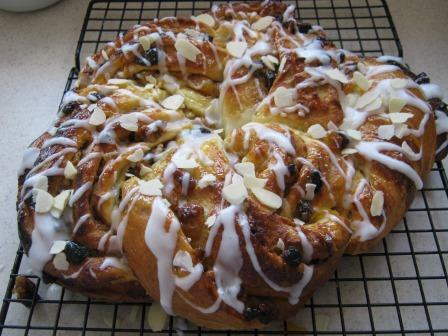 Another recipe from Paul Hollywood’s tv series. [Edit 2 Oct 2013] This page is getting lots of views this weekend, I’d appreciate any comments you have about why you’ve searched for it. Thank you 🙂 I see that they are repeating Paul Hollywood’s tv series at the moment, which is great if it encourages more people to start baking. 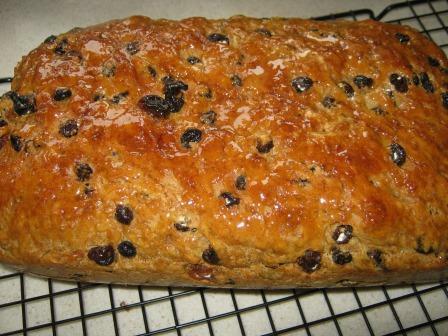 I’ve made loads of these loaves over the last 5 months, they are very easy. I’ve also found that if it looks like too much, then cutting a loaf into thirds or halves and freezing a bit is a good idea. Now back to the story…. I’m making this because frequent readers will know I’m training for the LondonSurrey 100 mile bike ride in August. As a result I am eating carbs like they are going out of fashion, and I need something that’s not too sugar loaded and isn’t cake to be taking on rides and eating as snacks. 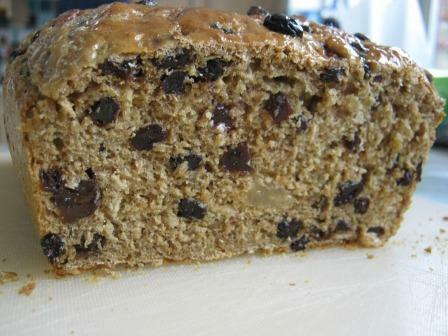 So as I do buy the occasional Soreen loaf I thought I’d have a go at the Paul Hollywood version. Original Soreen contains similar ingredients to the Paul Hollywood version, but no treacle and includes E150c (caramel) and preservatives. The recipe is available here. A pretty straightforward selection of ingredients, with treacle to give it browness. I’m not sure why he tells you to go to a baker for malt extract, I got mine in Holland and Barrett and Potters’ Herbal , Rayners Essentials , Meridian Foods brands are also quite widely available. There’s also the whole other world of brewing malts that could also be used. Some readers may recognise malt extract as ‘Roo’s strengthening medicine’, from the Winnie the Pooh stories. Like Kanga, my mother also used to give me malt extract on a spoon as a dietary supplement. It apparently contains vitamin A and riboflavin, and according to a Daily Telegraph article, the sugars are too easily absorbed causing an insulin spike and possibly diabetes in the long run. Well, a little of what you fancy won’t do much harm I suppose. I quite like the taste but don’t like the stringiness getting it out of the jar. 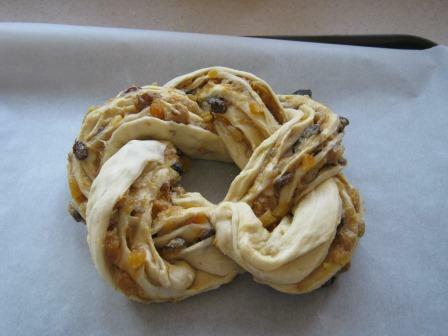 For my effort, I found I didn’t have any sultanas so threw in a selection of golden raisins, regular raisins, currants, and a few dried cherries that looked like they needed eating up. I also don’t have two 1lb loaf tins so it all went in one big one, and I used a flexible silicone one in case it stuck fast. 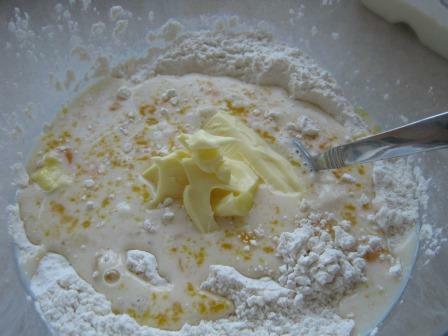 Easy recipe, mixing the gloopy ingredients and butter first. I used the microwave as all my small pans were in the wash after Sunday lunch. Then add to the dried ingredients with some water. 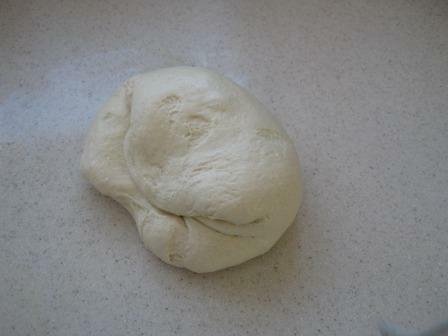 No tricky kneading, just enough to make sure it is mixed up evenly. 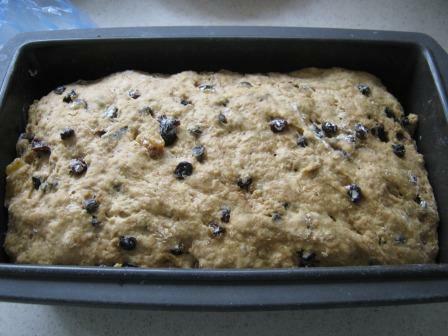 Then it goes into the loaf tin for a rise. I gave mine an hour and a half as I thought two hours looked too long, given the speed it was going it. Finally into the oven. The recipe says 30 to 40 mins, mine got the full 40, the last 10 with a foil cover. It didn’t rise a lot in the oven. I have topped it off with the recommended tablespoon of warmed honey (in the microwave again!). Then it was left to cool. Results? Yes, you get what it says on the tin. 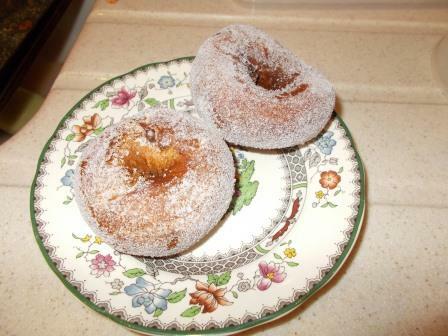 It’s not overly sweet, the fruit is plentiful and it’s not a fluffy bun-like crumb. The crust is nice and a bit crunchy. It will definitely get eaten. It would probably survive as a cycling snack wrapped in film or foil and put in a pocket, but it could be a bit less robust than a bun. Having worn my legs out cycling up the Col de Cogenhoe today, I’m not so sure it’ll last until my next long outing, so I might have to make another one for next weekend. At least it’s easy. Words I’d never thought of putting together. 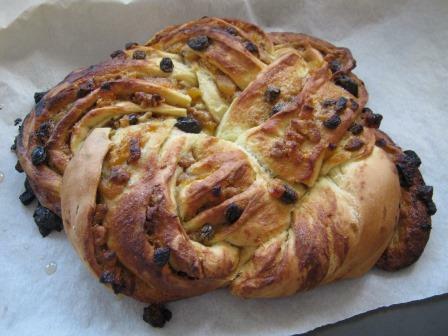 But the Daily Mail newspaper kindly published a little booklet with some bread and other baked goods recipes adapted from How to Make Bread by Emmanuel Hadjiandreou. I don’t have the book so can’t comment on what the adaptations might be or whether the book is any good but the recipes in the booklet seem straightforward enough. They don’t appear to be available online (although I’m happy to be corrected). What is nice about them is that they generally make a 1lb loaf size, which if you are new to trying to make bread might be enough and not too scary or expensive in terms of time or resources. When I’m trying recipes I often half or third or quarter to get a small amount to prove the concept. So good on the Daily Mail for starting small. 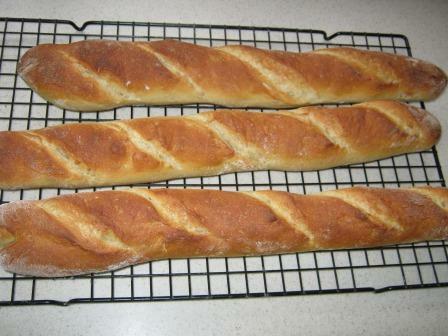 I wanted to try the baguettes after criticising that Paul Hollywood for dousing his in olive oil. 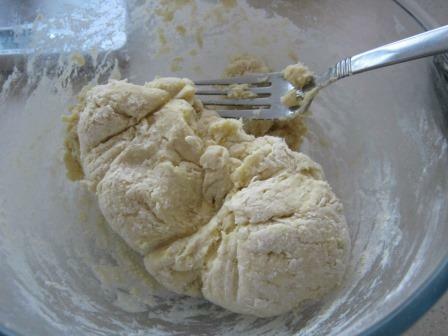 This recipe only has yeast, salt, water and flour. You make a poolish (love the word, but it is something that can be off-putting, all that new lingo – I prefer the term sponge). 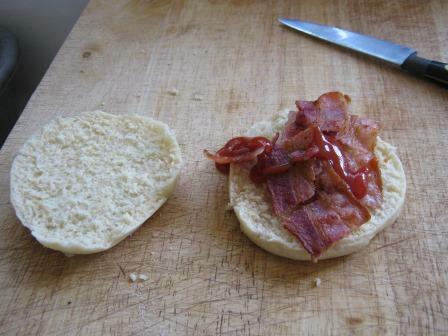 Now here’s a case when the recipe says ‘leave over night’ and then ‘next day’. I really hate it when they aren’t precise about timings. So do I make it last thing at night and get on with it when I wake up? Can I leave it until I get home from work? I decided to make the sponge this morning, giving it about 7 hours until I got home from work and the school run before I did the next stage. 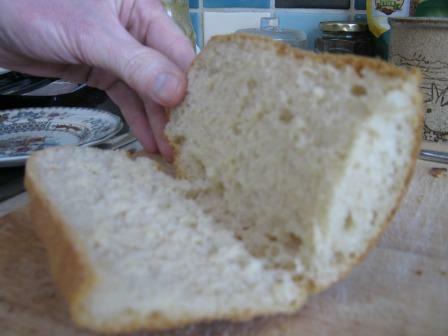 So the sponge is a bit of flour, a tiny bit of yeast and some warm water. 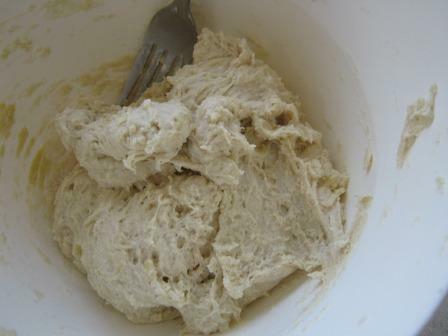 1g of active or instant yeast (2g of fresh) 125ml warm water, 125g flour. The recipe calls for plain flour, but I’ve gone with the strong white bread flour, for no other reason that they didn’t explain why it should be plain flour. I know there’s a difference between French flour and ours, which is I think because the French flour has lower protein but we’re going to have to go with it for today. 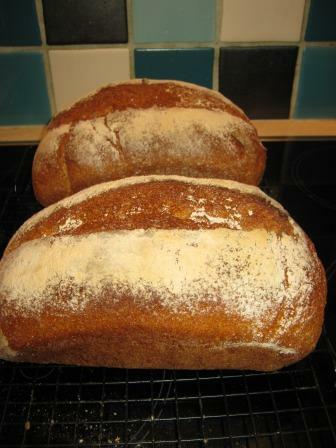 I’ve used the French flour from Shipton Mill before, and really must get some more. There’s a picture below of what it looked like when I added the other things. 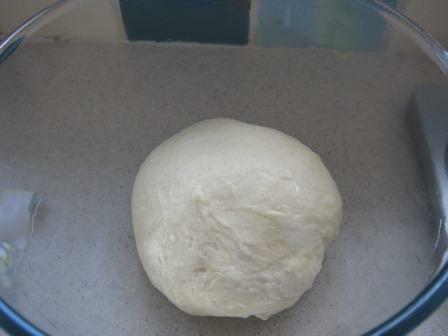 Then you add more water, yeast, flour and the salt. 155ml warm water, 1g of active or instant yeast (2g of fresh), 300g flour, 1 tsp salt (and I did go all the way as it isn’t far off the 1% salt we be targeting). 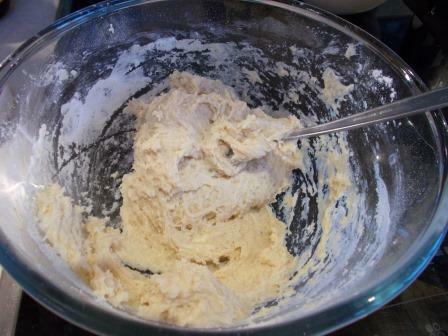 The recipe uses the Dan Lepard approach of bringing it all together, leaving 10 mins, kneading briefly, and then doing all that another 3 times. Nice! 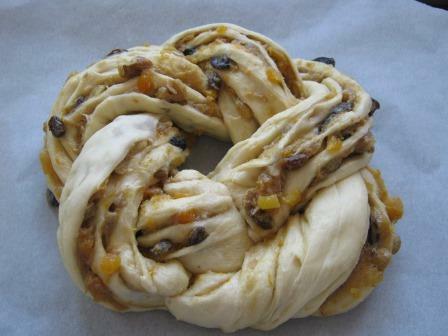 I made a marmalade cake in the rests. 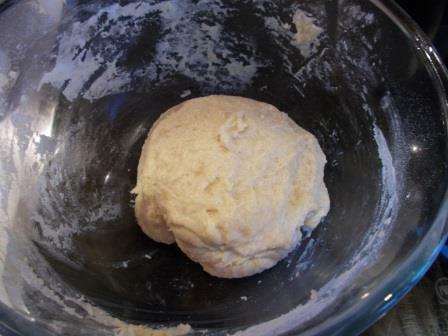 Pictures below of the dough after the kneads. Then it is left for an hour. Divided, folded, rested, rolled out, and left to rise. There’s lots of rising time because there’s only about half a teaspoon of (fresh) yeast in the whole thing, so the rising is made nice and slow. Then baked really hot at 260C for about 10-15 minutes, in a steamed oven. So, what do we have? 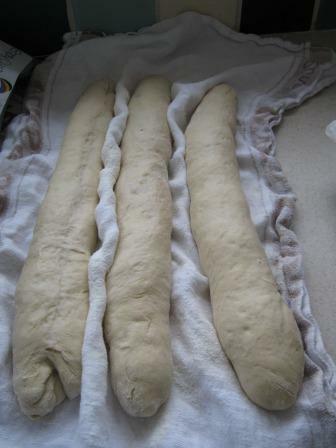 Long, brown bread sticks, made without fat of any kind. Got a bit of oven spring out of them, but could have done with more. Could also have been a bit more crunchy, so also maybe proving a bit longer, but will do nicely for sandwiches tomorrow. 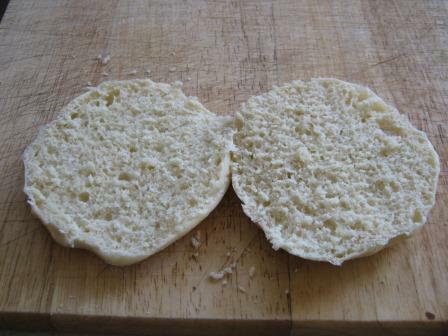 I’ve had quite a few people arriving at this blog because they are searching for reasons why their Paul Hollywood bloomer hasn’t risen. Obviously I don’t know why ‘yours’ didn’t go quite the way you wanted, but here are some points to look out for next time you try, in the order that they might have happened. You might have had several of these things not quite on the button which also would influence what happened. Water – the recipe says to add two thirds of the water first then gradually add the rest. 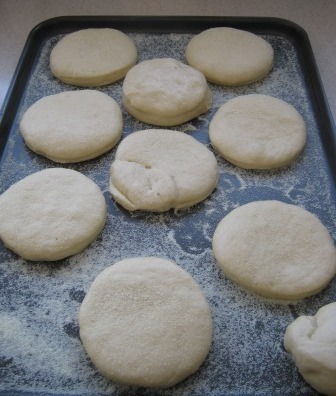 Different types of flour absorb water at different rates, so you might not need all of the water. 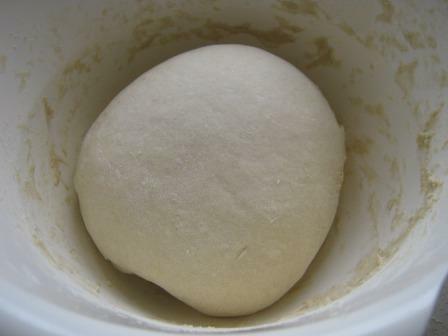 If you used a flour that couldn’t absorb it all, the dough would be sticky and hard to work. Try a bit less water next time. 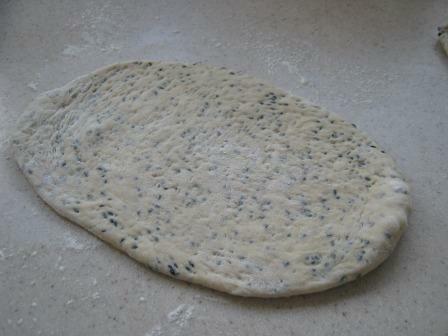 The dough should be easily workable but not sloppy and sticky. River Cottage bakers suggest 300ml to 500g of flour, so 320ml might be too much, but don’t go below 300ml. 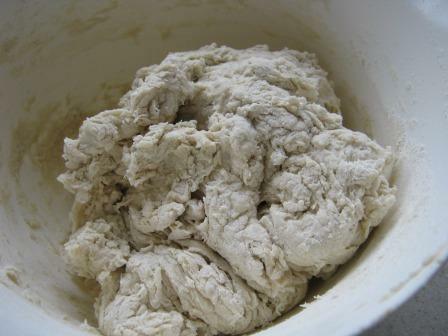 Flour – low gluten flour can affect the rise and make the bread dense and ‘cakey’ according to the River Cottage bakers. 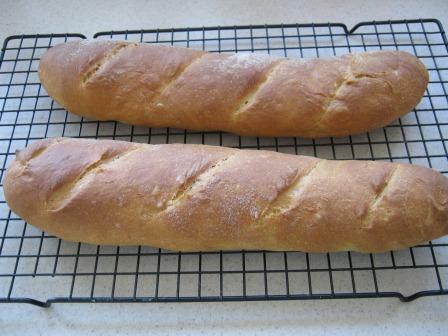 If you are new to bread baking make sure you are using ‘strong bread flour’. Supermarket brands are just fine for starters, also try Allinsons or Shipton Mill if you can get it. 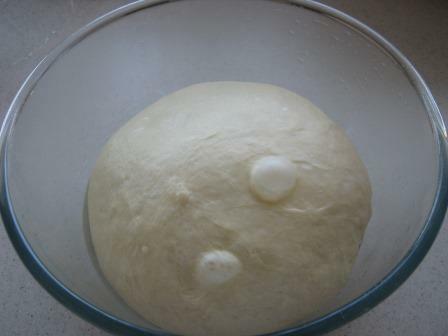 Oil – did it mix in with the yeast? Getting oil on the yeast can slow the activation of the yeast and your rising may have been slow as a result. Too much oil? If too much went in that can affect it as well. Temperature – of everything including the water. If your kitchen has been Baltic like mine recently, you might not have got much of a rise if the water was cold as recommended by Paul. I tend to use water that is 1:3 boiling to tap water just to get the yeast going. If your kitchen is nice and warm you can go cold. The water should not feel warm to the touch in any case. If your kitchen was Baltic, then the length of time you need to get everything going for both rises will be longer than Paul says, but bear in mind the touch test below. You can also warm your utensils if you think it is too cold, ie warm a ceramic bowl with hot water before starting. 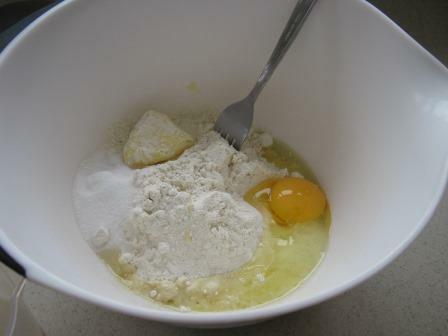 Adding extra flour to counteract the stickiness of too much water. 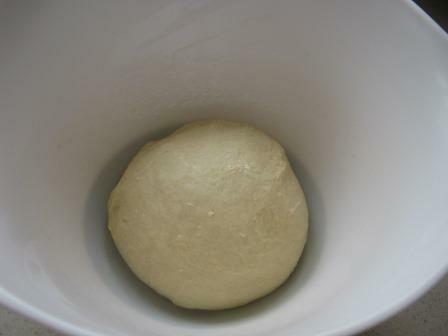 If you found the dough hard to work because it was too wet and added extra flour it will have weighed the loaf down and made it less keen to rise. 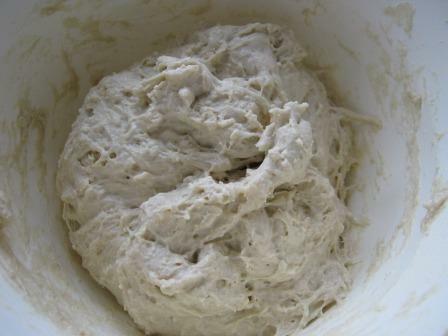 Kneading – River Cottage bakers might say you should knead more than you did. 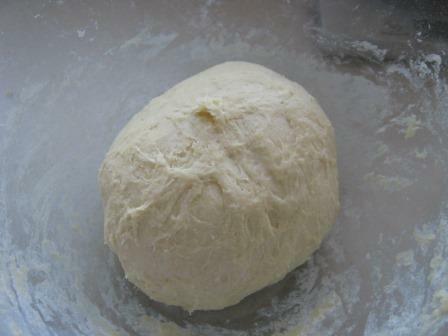 Dan Lepard might tell you that you don’t need to knead so much (see my blog on the bloomer loaf). So long as it got folded over a few times you’ll like as not get a loaf of some sort or other, but if you choose not to knead you should take it into account during the rising time and not leave it too long. 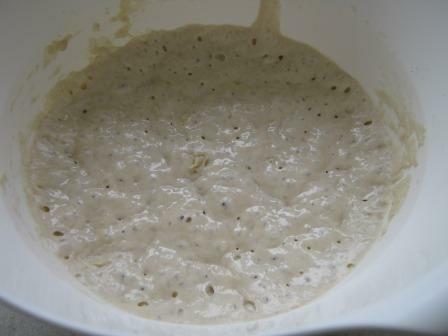 Rising time – Paul says to leave until it has tripled in size – that could be too long and your yeast wore itself out. Other bakers like Dan Lepard say 50%. 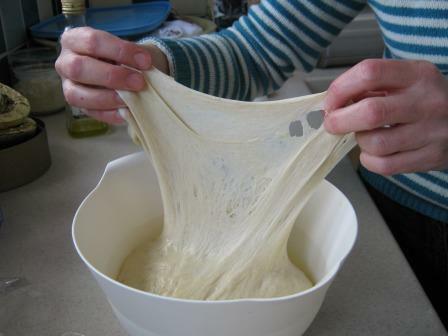 If the dough smelt yeasty when you knocked it down after the rise, then it might have been left too long. Not leaving it long enough can also make it solid and dense with a rubbery texture, so it is important to get it right. If your kitchen is toasty warm then you may have left it too long. If you kitchen is Baltic cold, you might not have left it long enough. 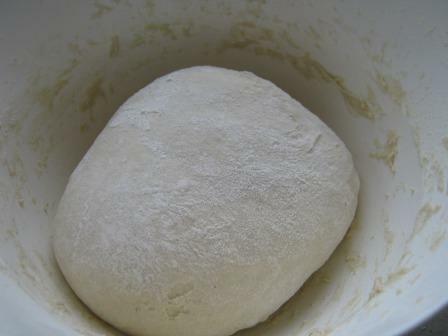 Shaping – I like to fold mine over several times when I shape my loaves, so it was a bit taller than Paul’s but not so long. 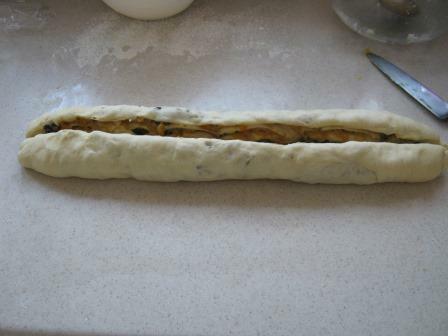 You can also fold it in a ‘blanket fold’ while it is rising, just to keep all the protein lined up and tight. 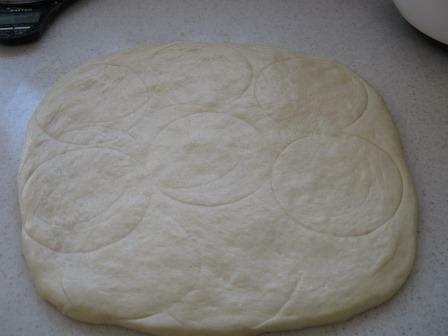 So pat out into a rectangle fold top in, then bottom over, repeat twice during rising. 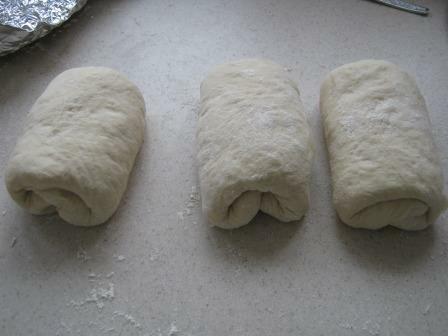 Or add an extra set of fold during by turning through 90 degrees and do a double blanket fold. This fold can also be used for shaping. 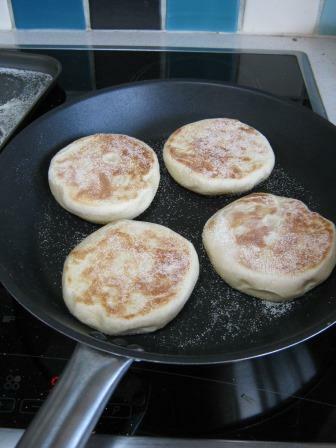 When to bake – Paul says to leave for 1 to 2 hours until doubled in size. Again, this could be too long, and Dan Lepard says 50% change in size again. 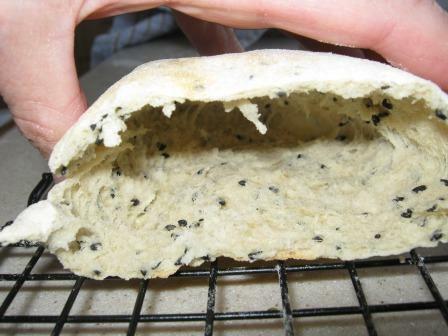 You need to have some ‘spring’ left in the loaf. If you poke your loaf with a finger, does it spring back or leave a dent? 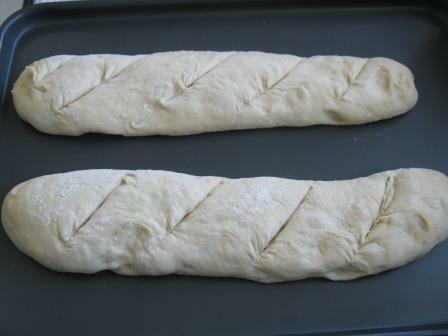 If it leaves a dent, it is almost too late, and it could fail to rise in the oven. The loaf should spring back a bit before it goes in, so try getting it in a bit earlier next time. Oven temperature – Paul says 220C which is hot, but if your oven is not entirely accurate it might not be hot enough. Try upping the temperature by 10C next time and see how it goes, if that’s not enough keep going higher next time but reduce the time for the first stage in case it burns. If you’re stuck with a fan-only oven, put it on as hot as it will go. 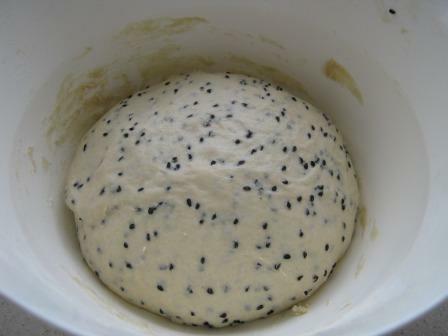 If the loaf still has some ‘spring’ then it will rise during the first stage when the oven is really hot. Then turn down if it looks like burning. So lots to think about there. Keep trying and I’m sure you’ll end up with something beautiful soon. 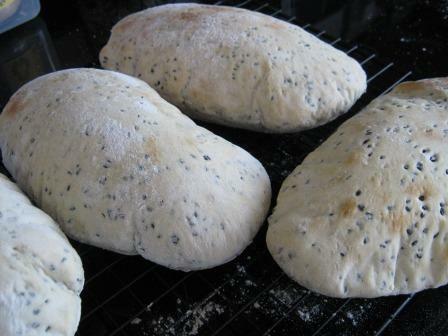 Other ways of making bread are available, and I’d encourage you to try a different approach such as some of Dan Lepard’s methods as they are less industrial and more suited to home baking. I wondered how long it would be before he got out a machine to do the hard work. Really, a machine that can cost hundreds of pounds needed to make a mix of 250g of flour? I think not. If you don’t have a food mixer then don’t despair, all you need is a bit more time in the preparatory period. Let’s do it the Dan Lepard way instead, but we’ll use Paul’s ingredients. 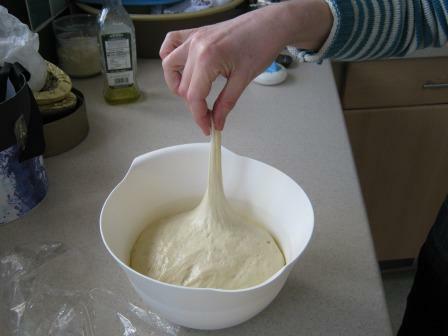 Of course you could just knead it by hand the Paul Hollywood way, but this is a bit easier. So, put all the ingredients in a bowl. 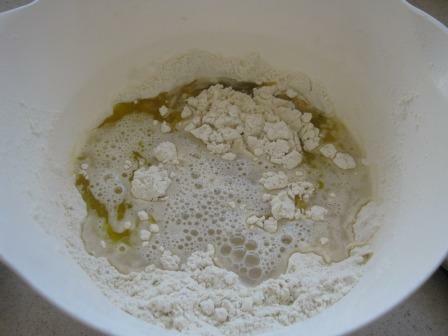 flour, oil, salt, yeast and water. I’m using fresh yeast today and warm water not cold, because my kitchen is positively Baltic and I want to give it a chance to get going. Warm water means 1 part boiling water to 3 parts cold tap water, it should not be warm to the touch. I also cut the salt by half. Let’s also not get into arguments as to whether proper baguettes need a lot of olive oil slopping in, we’re just going with it today. If you want a loaf without a lot of oil, try the Hairy Biker’s version from the Bakeation book, but you need another day or two to get that one going. Mix it all up, with a fork or fingers, it doesn’t matter, into a rough ball. Leave it for 10 minutes. 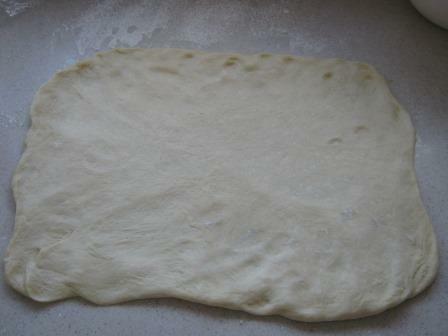 Oil the work surface, tip it out, pat it down then do a Dan Lepard knead, just fold it over on itself 10 or 12 times. Leave for another 10 minutes. Knead again, leave again, knead again, then we’re back into Paul’s recipe so pop it in a bowl for about 2 hours, I left mine for about an hour and a half. And it was all nice and stretchy. 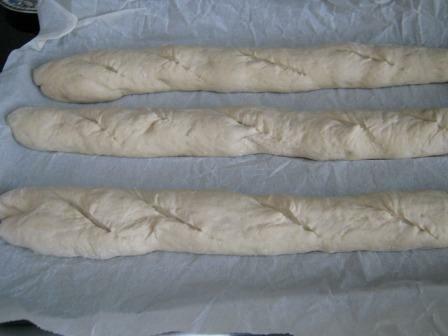 I don’t have a fancy baguette tray either so today they’re going on a heavily floured tea towel for the rise. 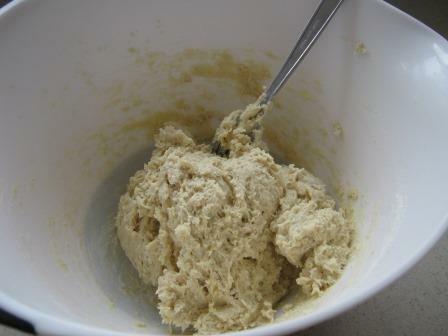 The online recipe doesn’t have the semolina mix that the TV programme did, so I’m leaving that off as well. I put a baking tray in the oven to get nice and hot before I put the bread in, and I did steam the oven. And I reduced the total baking time by 10 minutes by doing that. Slightly disappointed that they didn’t spring much in the oven, but they were quite crunchy and went down well with some cheese and salad.